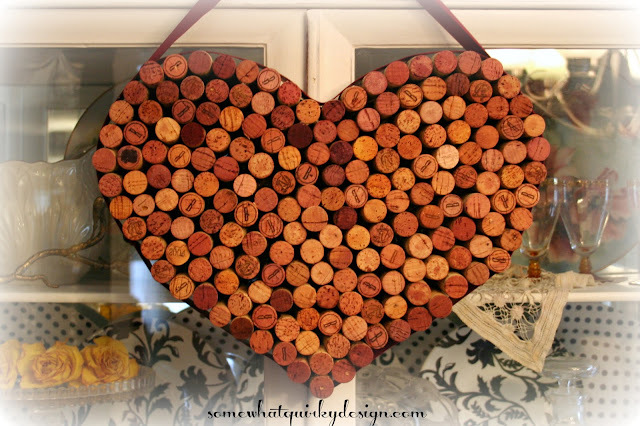 Sometime over the past couple of years I saw a heart made from wine corks that I liked a lot. I would show it to you but I can't find it. So you'll have to make do with seeing the one I made today. First I got out my wine corks and picked out the ones with pink or red ends. Then I cut a heart out of cardboard. I just refreshed my cardboard collection when I cleaned up the basement last week. 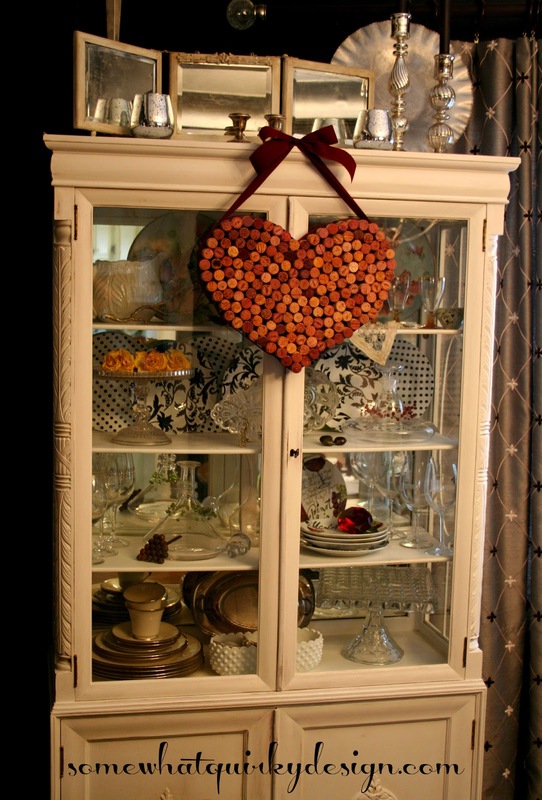 I covered the cardboard heart with corks - via the glue gun. Then I put some leftover Christmas ribbon around the base of the corks. Just so you'll know - every one of these corks is at least pale pink. I couldn't get all the color in the pictures for some reason. I'll probably put this on the front door for the week of Valentines Day but for now it's hanging out inside with me. It's kind of pretty. I like seeing it. I LOVE that!! Thank goodness I have a TON of corks....I see my next project!! I love the shape too...kind of wider....looks GOOD! oh HECK yes! Love it!! It's such a cute idea, and I just love the variation in colors. It gives it added umph. Love this! I like doing things with the stuff I have! Good idea! This is a fabulous wine cork project! Love it! I love it right where it's hanging! So cute! a toast to you for a really cute heart! Really pretty!! My only problem is that we don't drink!! LOL!! I have seen a lot of wine cork projects, but I think this is the best yet. The shape of the heart is really nice too. Great job. Thanks for sharing. This is such a great idea. Love that you used red wine corks. So pretty, thanks for the idea I need to try this! How cool is that! I found you on the Clever Chicks Hop and I would love to have you join the fun on my Creative HomeAcre Hop! Very nice, Karen. 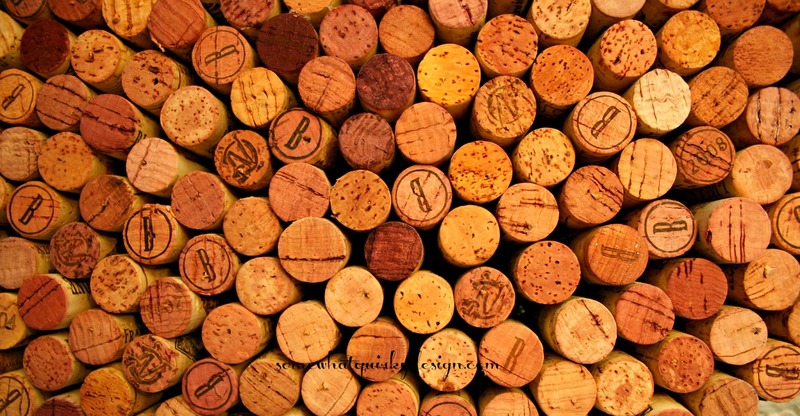 You come up with some great cork ideas. I really should try to do a project. Heaven knows we have enough corks to float a battleship around here. That is so nice! I like this idea-That's a lot of corks! --how long did it take you to collect those corks? Did you have someone else helping. Something funny...I'm not a wine drinker, but a few years back (about 6) The Honey and I decided we'd have 1 glass each evening. Well, we didn't like it. We tried several. 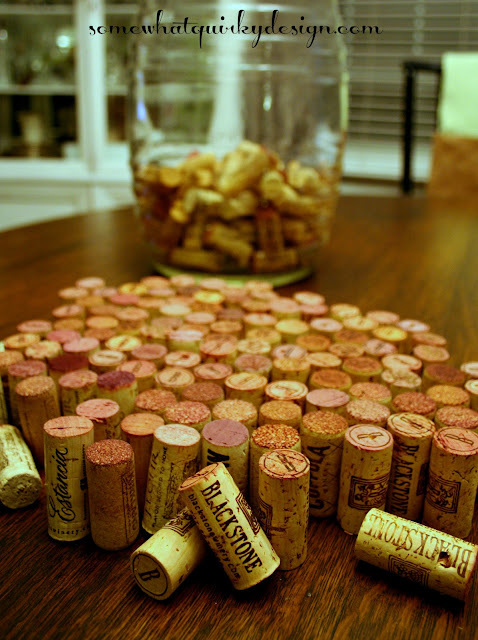 (about 5) ...yes, guess how many corks I have in my collection?! I love this. I want to make one. Can you buy corks? Thanks for sharing! How pretty, I love the heart! You did a great job with this, it looks fantastic! OMG, that is adorable! Great idea! A girl after my own wine-cork heart! Love this idea and I've got plenty of corks just waiting to be used. Thanks for linking to Something To Talk About! Hope to see more of your posts shared at the party! !